Mississinawa Valley’s Trent Collins is called out in a controversial call at the plate against Tri-County North. The Blackhawks lost a game that was closer than the score would indicate against an always tough Tri-County North team. The Blackhawks are in the middle of the standings and a win would have moved them up a notch, but they would end up shooting themselves in the foot in the fourth inning allowing North to score some unearned runs. North went up early 1-0. Mississinawa Valley had a chance to even up the score in the fourth inning. Trent Collins had a base hit and had advanced to third. On a hit ball he went hard to home plate but in a close play he was called out. There were some protests from the dugout that generated a warning from the umpire, but the call stood. In the top of the fourth the Blackhawks were generous to the host Panther team. The first batter reached base after being hit by a pitch. The next was walked. Then an error loaded the bases. A sacrifice fly and then another error brought these runners in and then another run was scored. Pitcher Trent Collins recovered and had 2-strike outs in the inning. But not before North took the drivers seat with a 5-0 lead. Also in that inning, Collins had a close call. A line drive hit his back and although he tried to make a play, he collapsed on the field. It was a nervous five minutes as he was attended to by the staff but he was able to retake the mound and finish out the inning by striking out the next batter. He will be sore tomorrow, but he showed some grit tonight. The Blackhawks made one last charge in the seventh inning. The North starter had some control problems and loaded the bases with a couple of walks and a Max Dirmeyer base hit. The next batter flew out in right field and that ended the night for the team. It was a 5-0 loss, but take away that fourth inning and if one of baserunners in the seventh finds home plate then its a different ball game. Next up for the Blackhawks will be Twin Valley South. A young team, but a team that lost to North by only a run. 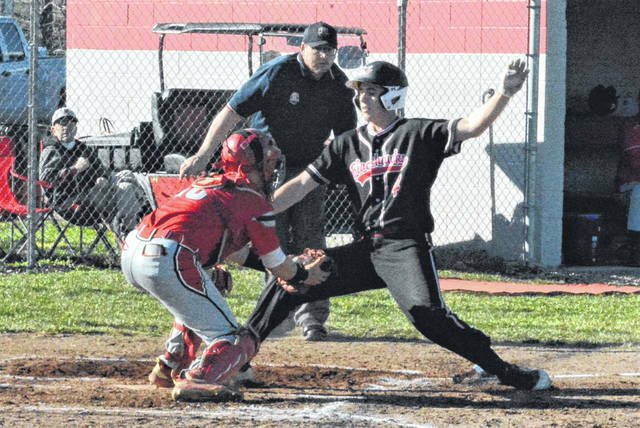 https://www.dailyadvocate.com/wp-content/uploads/sites/34/2019/04/web1_Trent-Collins-out.jpgMississinawa Valley’s Trent Collins is called out in a controversial call at the plate against Tri-County North.